Searching around on the web OvR can across an article titled “How To Hit The Ski Slopes From New York City Without a Car,” written Mathew Katz of the Huffington Post. 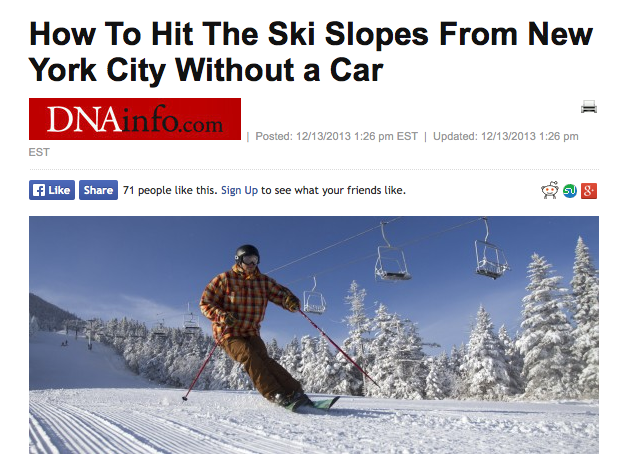 The article gives New Yorkers a guide to bus providers running trips to East Coast mountain resorts. OvR was mentioned as the top trip provider to the “car-free set” of New Yorkers looking to hit the slopes and enjoy this amazing powder that’s falling in the city. We are super stoked to see OvR acknowledged by the Huffington Post and want to thank the author Mathew Katz for the write up. We hope to continue our services to New Yorkers as well as the East Coast market to provide riders an epic 2013/14 season. This entry was posted in News, OvR Shout Outs and tagged East Coast mountain resorts, Huffington Post, New Yorkers. Bookmark the permalink.